SugiHara brand chainsaw guide bar. Made in Japan. Highest Quality. 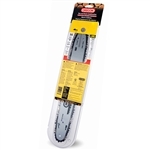 SugiHara brand chainsaw guide bar and chain combo. Bar and chain combo by Oregon. Raisman brand high quality chainsaw guide bar and chain combo. Nose size: Medium - 1.33"
Raisman brand high quality chainsaw guide bar. High quality. Made in Italy. Raisman brand high quality chainsaw bar and chain combo. Meteor brand piston assembly. 50mm.